This article is about the village. 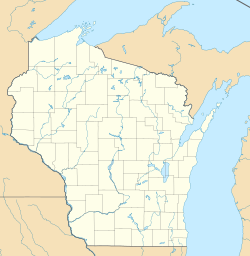 For the adjacent town, see Osceola, Polk County, Wisconsin. For other uses, see Osceola (disambiguation). Location of Osceola in Polk County, Wisconsin. Osceola is a village in Polk County, Wisconsin, United States. The population was 2,568 at the 2010 census. Located mostly within the Town of Osceola, the village sits on the border with Minnesota, separated by the St. Croix River. The village was named after Osceola, chief of the Seminoles. Osceola is located at 45°19′20″N 92°41′54″W﻿ / ﻿45.32222°N 92.69833°W﻿ / 45.32222; -92.69833 (45.322365, -92.698534). Cascade Falls, a 25-foot (7.6 m) waterfall with a 30-foot (9.1 m) crest on Osceola Creek, is located in downtown Osceola. According to the United States Census Bureau, the village has a total area of 4.32 square miles (11.19 km2), of which, 4.19 square miles (10.85 km2) of it is land and 0.13 square miles (0.34 km2) is water. As of the census of 2010, there were 2,568 people, 1,142 households, and 660 families residing in the village. The population density was 612.9 inhabitants per square mile (236.6/km2). There were 1,289 housing units at an average density of 307.6 per square mile (118.8/km2). The racial makeup of the village was 96.0% White, 0.3% African American, 0.3% Native American, 1.0% Asian, 0.9% from other races, and 1.6% from two or more races. Hispanic or Latino of any race were 2.1% of the population. There were 1,142 households of which 32.7% had children under the age of 18 living with them, 38.6% were married couples living together, 13.2% had a female householder with no husband present, 6.0% had a male householder with no wife present, and 42.2% were non-families. 36.0% of all households were made up of individuals and 11.5% had someone living alone who was 65 years of age or older. The average household size was 2.25 and the average family size was 2.91. The median age in the village was 36.4 years. 26.1% of residents were under the age of 18; 7.1% were between the ages of 18 and 24; 27.4% were from 25 to 44; 26.6% were from 45 to 64; and 12.8% were 65 years of age or older. The gender makeup of the village was 47.3% male and 52.7% female. As of the census of 2000, there were 2,421 people, 1,002 households, and 615 families residing in the village. The population density was 656.9 people per square mile (253.3/km²). There were 1,072 housing units at an average density of 290.9 per square mile (112.2/km²). The racial makeup of the village was 97.44% White, 0.37% Black or African American, 0.33% Native American, 0.21% Asian, 0.37% from other races, and 1.28% from two or more races. 0.91% of the population were Hispanic or Latino of any race. There were 1,002 households out of which 35.5% had children under the age of 18 living with them, 44.9% were married couples living together, 12.0% had a female householder with no husband present, and 38.6% were non-families. 31.3% of all households were made up of individuals and 10.8% had someone living alone who was 65 years of age or older. The average household size was 2.38 and the average family size was 3.01. In the village, the population was spread out with 27.9% under the age of 18, 9.8% from 18 to 24, 32.9% from 25 to 44, 16.7% from 45 to 64, and 12.7% who were 65 years of age or older. The median age was 33 years. For every 100 females, there were 92.4 males. For every 100 females age 18 and over, there were 88.2 males. The median income for a household in the village was $39,000, and the median income for a family was $45,846. Males had a median income of $33,017 versus $22,453 for females. The per capita income for the village was $18,921. About 4.3% of families and 6.1% of the population were below the poverty line, including 7.2% of those under age 18 and 6.0% of those age 65 or over. Osceola is served by the Osceola School District. Osceola High School has grades 9-12. L.O. Simenstad Municipal Airport (KOEO), serves the city and surrounding communities. In 2006, a glider club was based there. The Osceola and St Croix Valley Railway Museum is in Osceola, operating out of the historic 1916 Soo Line Depot. The railway moved to Osceola in 1992. This page was last edited on 4 April 2019, at 18:41 (UTC).